Step 1: Create a new contribution form by clicking on “Create form” in the upper-left corner of your campaign Dashboard or navigate to a previously created form by searching for it in the Contribution Forms tab. Once you’ve located your form, click the “Edit” button. Step 2: This will automatically open your form editor. 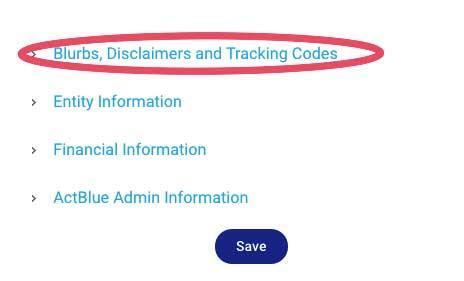 If you just created a form, you will also be brought to this page. 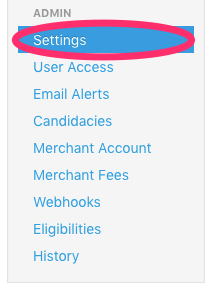 Select “Recurring Settings” from the menu. Step 3: As a default, your form will be set up to accept unlimited monthly contributions. 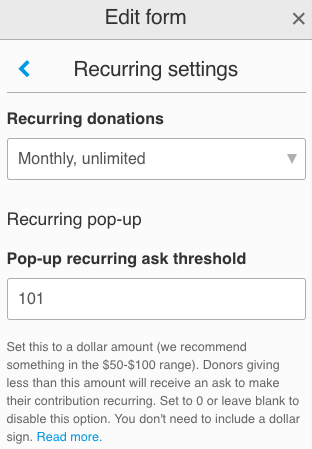 It will also automatically use pop-up recurring asks with a threshold of $101: This means that after a supporter gives a one-time contribution that is less than $101, a pop-up box will appear that asks them to make their donation recurring. 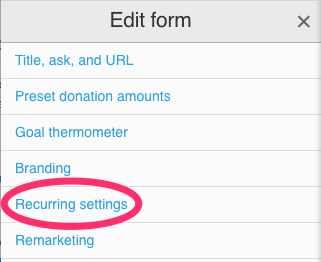 You can easily change both of these settings in the “Recurring settings” tab. To change the pop-up ask threshold, just enter a different dollar amount in the “Pop-up recurring ask threshold” box. To turn off pop-up recurring asks, enter “0” in the box. Instead of unlimited monthly contributions, which can recur as long as a donor wants to remain a monthly supporter, you can choose a different setting in the “Recurring donations” dropdown. You can choose to use monthly contributions that recur for a specified amount of time, or use unlimited monthly recurring and smart pop-up recurring together. The combination will show one-time donors a pop-up prompting them to commit to a monthly contribution amount that is smaller than their initial contribution. You also have the option to disable recurring contributions on your form. Make sure you click on the orange “Publish changes” button to save any changes you make. Now you’re ready to send out a fundraising email! You’ll want to make sure you pre-set the links for recurring and specifically ask for a recurring contribution in your email. It's easy to pre-set your links for recurring. If you’ve set the form to use unlimited monthly contributions as suggested above, you can do this by clicking on the Promote button on the left side of your form. To ensure that the recurring option is preset, set the “Recurring” section to ‘1’. If you’ve set the form to use specified duration monthly contributions, write in the number of months it will recur for. 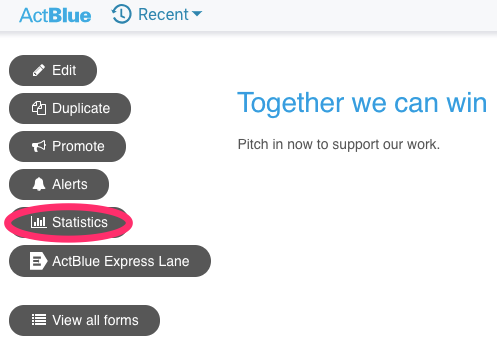 When you write your fundraising email, your ask should read something like “Can you chip in $10 a month?” And if you’re using ActBlue Express Lane, your link should say “Express Donate: $10 a month.” You can read more about that in our ActBlue Express Lane section. Donors can always choose to give a one-time donation instead of a recurring contribution when they reach the contribution form, but it’s important to make the recurring donation process as frictionless as possible for supporters. You need to make a specific appeal to your donors for a recurring contribution and explain why a sustained commitment is needed. If your organization is planning a series of big events over the next year, make sure you let donors know how important these efforts are to your cause. You can view the recurring contribution data for a specific form by clicking on “Statistics” in the left-hand corner of your form. Email receipts will automatically go out to all recurring contributors when their donation is processed. These receipts contain a link that allows donors to alter the number of months of their contribution, cancel it completely, or update their credit card information. The dollar amount cannot be altered. Recurring donations can be cancelled at any point in time. ActBlue’s integration with Account Updater automatically updates most expired or lost donor credit cards in our system, preventing lost contributions. However, occasionally credit cards will still be declined. In this case, we send an automatic email letting the donor know that they were not charged and that they should update their information. If a donor does not update their card, they will not be charged that month, but we’ll attempt to process the contribution again the next month. Many donors will opt to email ActBlue instead of making a change through their receipt. In that case we’re happy to take care of these tasks for them. 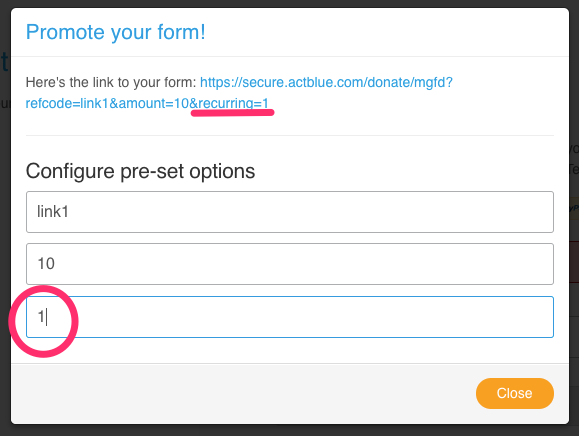 If your donors contact you with questions about their recurring contribution, you can forward them to us at info@actblue.com. We have a great customer service team and make every effort to get back to donors during the same business day. Under the “Email Message Blurbs” you’ll see a place to edit the recurring email blurbs. This message will be included in your recurring donors’ receipt each time a recurring donation is charged. Donors have the option of cancelling their commitment, but we find that upwards of 80% of the pledged money actually comes in. That has a lot to do with the relationships that you build with supporters over the course of their commitment.